Cuomo Pledged $50 Million. ROC the Riverway is $500 Million. Governor Andrew Cuomo came to Rochester to announce $50 million for our ROC the Riverway initiative. This is a series of infrastructure projects designed to enhance, preserve and beautify the riverfront in an effort to revitalize downtown. We obtained a document dated December 1, 2017 that pitches the project to the state. The document lists $500 million over several phases lasting 10 years. Rewatering the Broad St. Aqueduct would cost $35 million. Creating a terrace by the library would cost $8 million. Renovating the convention center would cost $125 million. Renovating the Blue Cross Arena would cost $37 million. Rebuilding Charles Carroll Plaza would cost $25 million. Creating a “Welcome Connection” on St. Paul St. connecting to High Falls would cost $40 million. 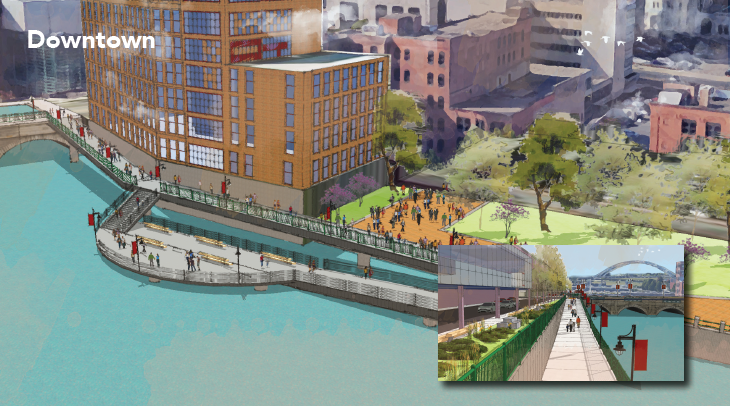 Building a pedestrian bridge between Corn Hill Landing and Erie Harbor would cost $16 million. Building a bridge over High Falls would cost $28 million. Turning Beebee Flats into a destination would cost $17 million. Creating an extreme sports destination at High Falls would cost $30 million. As you can see $50 million won’t go very far. The governor funded 10 percent of what the city wants. While $50 million is a lot of money, it equals how much more Rochester gives its schools every year than Buffalo. Rochester also gets $200 less per capita than Buffalo. Fifty million dollars doesn’t even begin to make us whole. Furthermore, that $50 million covers less than half of the city’s first phase of projects. The good news is the city is developing a comprehensive plan to address some of its pressing infrastructure needs, such as the arena and convention center. Creating an advisory board indicates a willingness to accept public opinion and be transparent. Some of these projects are exciting. Funding may come incrementally. But for now, we should temper our enthusiasm, because there’s a long, long way to go.